My love of pirates probably started when I was little with Disney World holidays, where the Pirates of the Caribbean ride has always been a favourite. 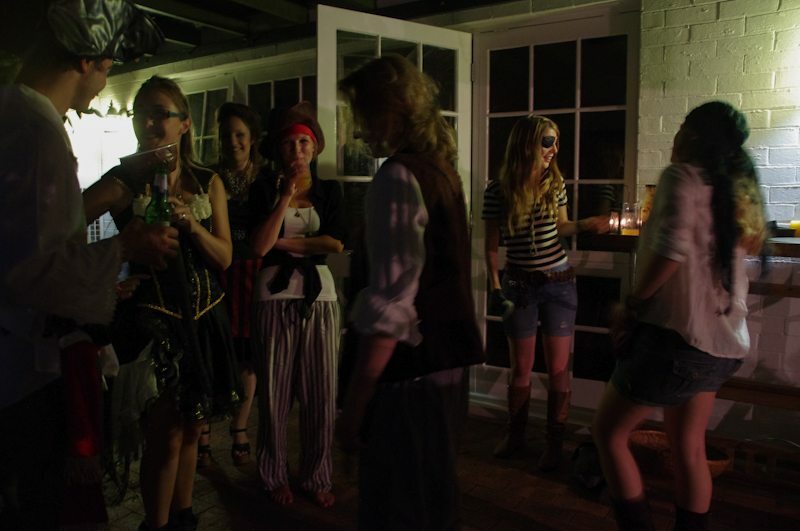 Somewhere along the way, I found myself beginning to throw pirate parties. 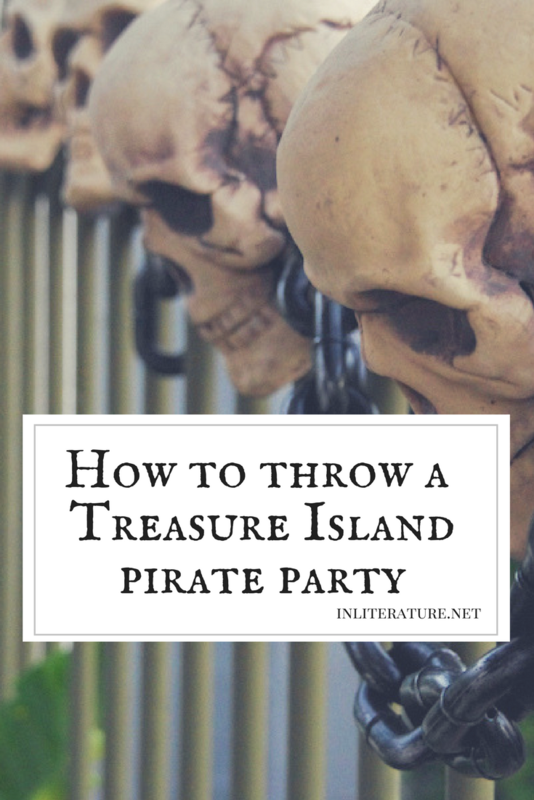 There are lots of aspects of Treasure Island that could inspire you, but for our party, we did ‘pirate’ with subtle details that were a nod to scenes within the book. 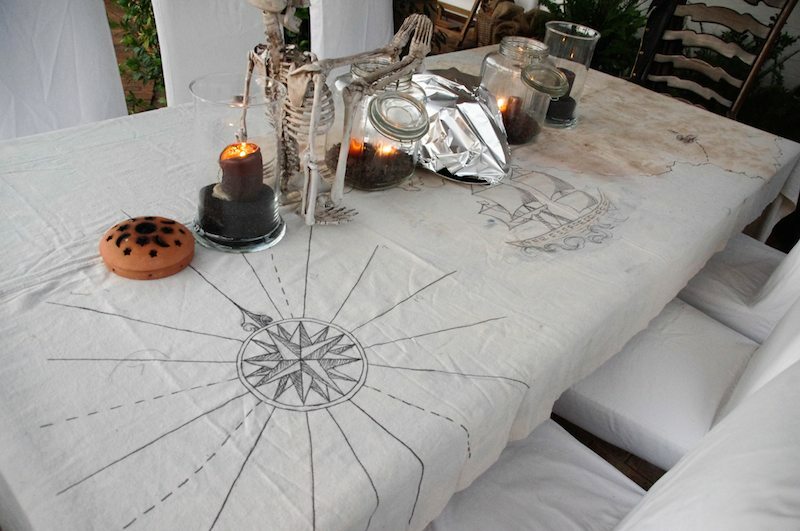 This tablecloth was hand drawn using Robert Lewis Stevenson’s Treasure Island map as inspiration/reference. 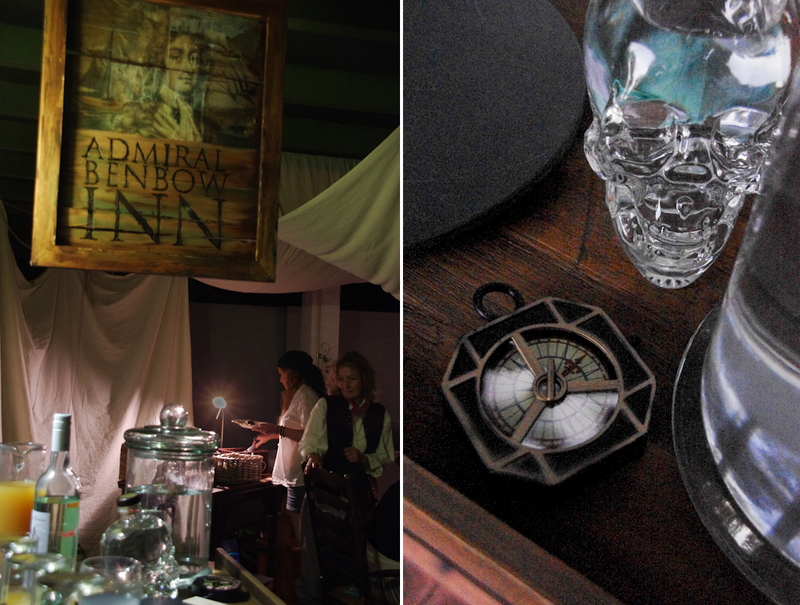 Use a canvas drop cloth that fits your table, and permanent black marker and paints to draw on treasure chests, a ship, compass and ‘Headhunters’. 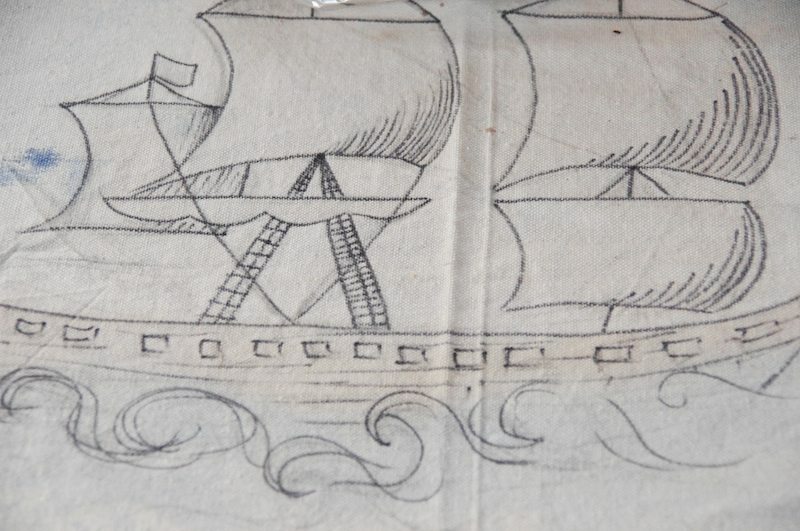 Enlarge sections of the Treasure Island map, print, then trace with heavy pencil on the back. Press the pencil side down onto the canvas and trace on the printed side with another heavy pencil to transfer an outline. 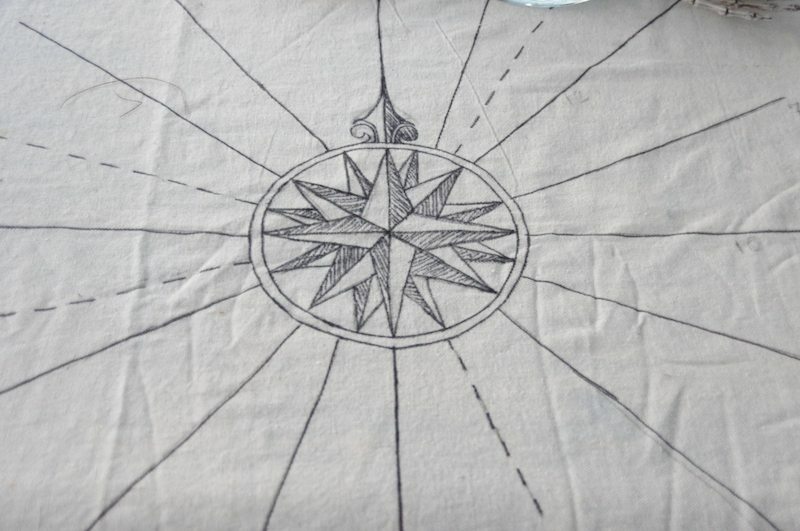 Retrace the light lines on the canvas with the permanent marker. 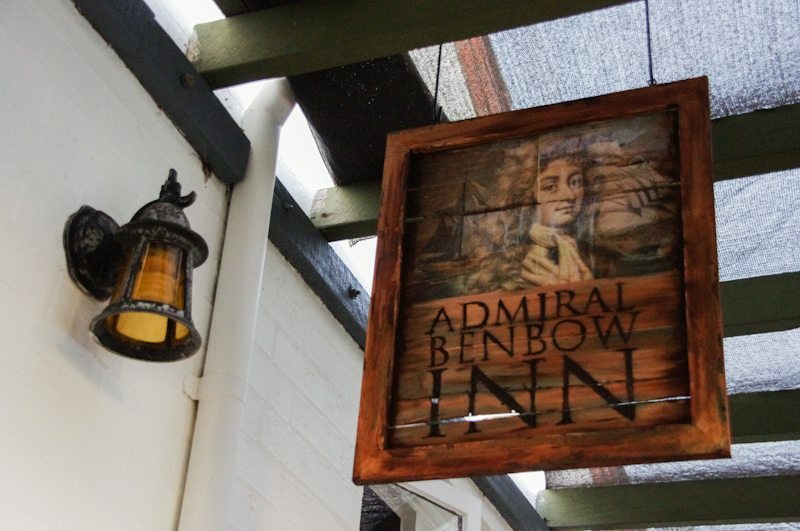 The Admiral Benbow Inn is the first scene in the book, when Jim Hawkins first meets “Billy” Bones. 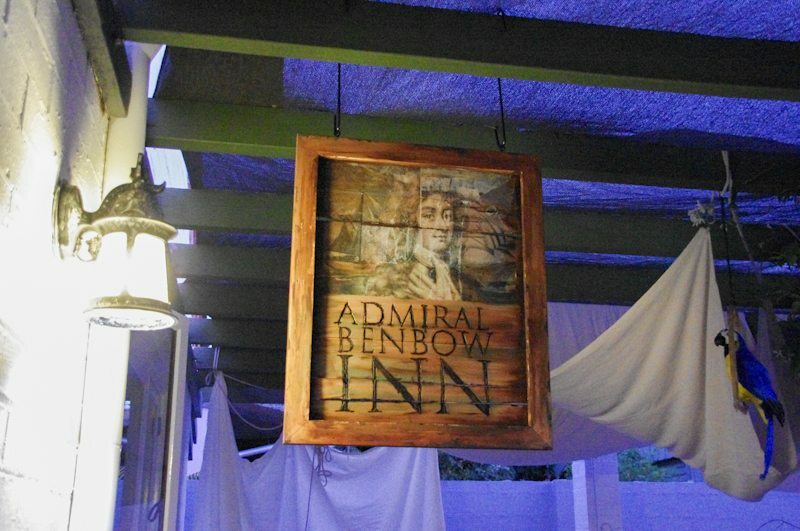 Make your own Treasure Island Admiral Benbow Inn signage here. 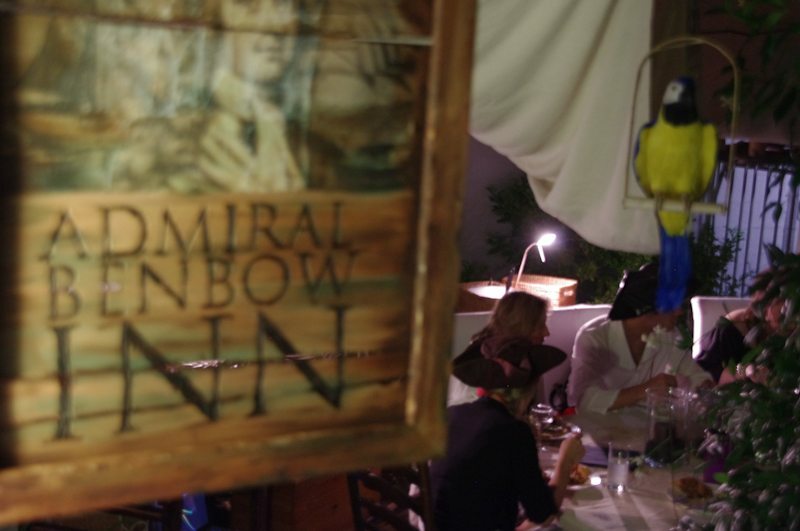 To quickly set the scene of a ship, use a mixture of painter’s canvas and off-white sheets (dye them with coffee if needed) to drape around beams. Finish off by draping ropes around the beams. 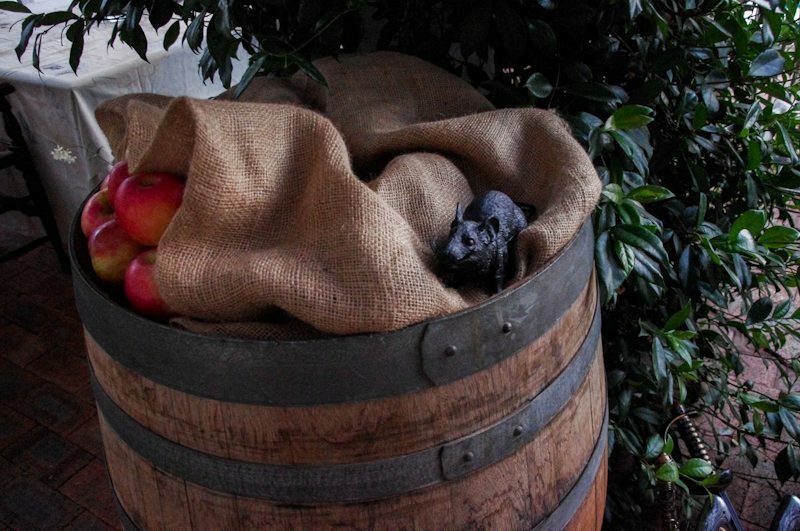 With apples on top so it seemed filled, the large wine barrel is a nod to the scene where Jim Hawkins overhears the pirates talking. 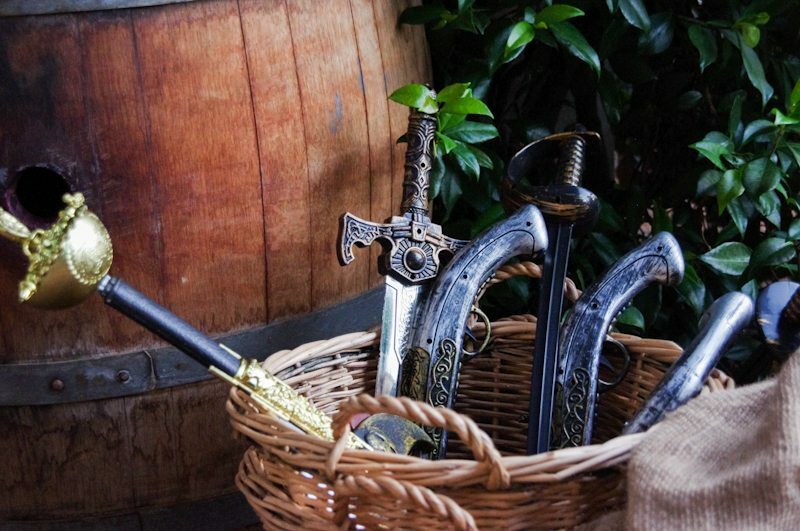 Modern appliances look out of place on a pirate ship so use wicker baskets to hide your food warmers. 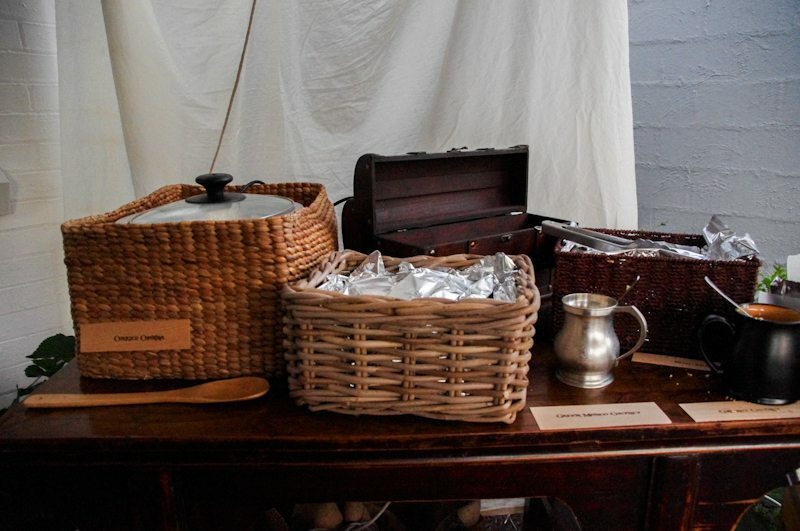 Alternatively, line wicker baskets with clean tea towels to hold chips or breads. 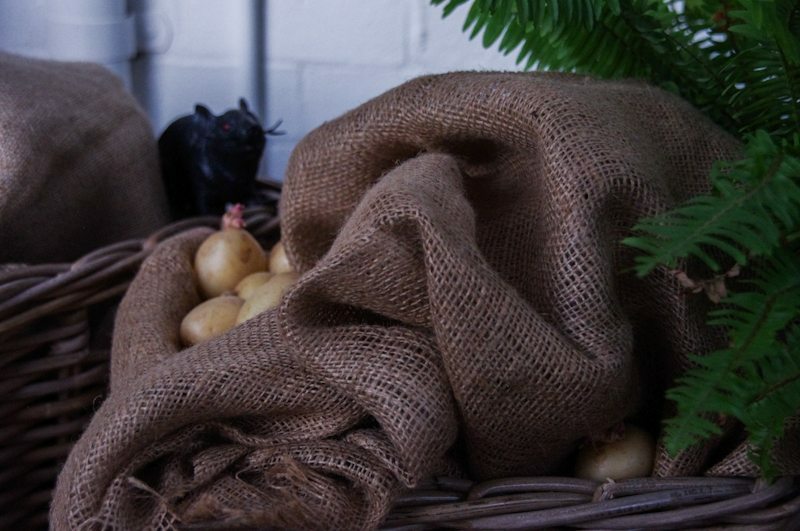 If you have only a few pots of food, stuff additional wicker baskets with plastic bags (they don’t need to be filled completely) then top with hessian sack coffee bags and vegetables like potatoes growing roots and hiding plastic rats (very much what being on a ship might have been like). 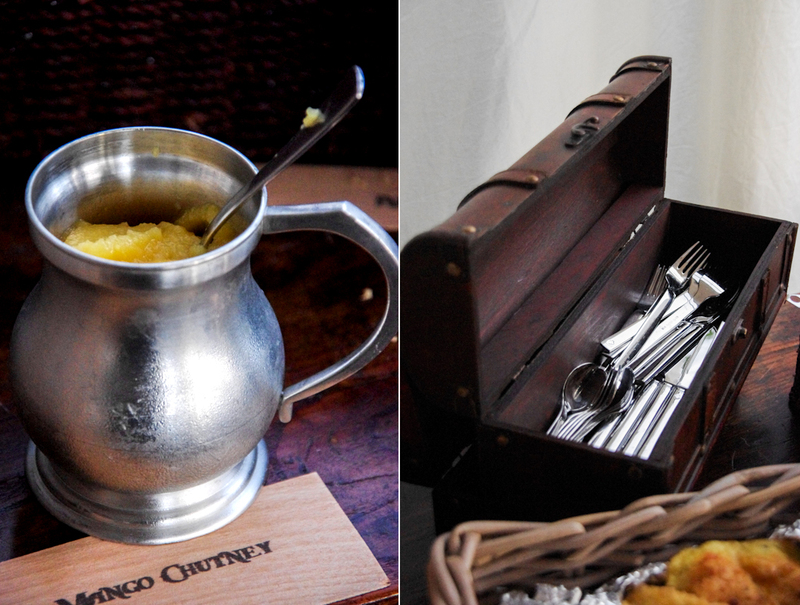 Use a small wooden chest to held cutlery and metal steins to hold sauces. Print food labels on thin balsa wood using the font Papyrus. 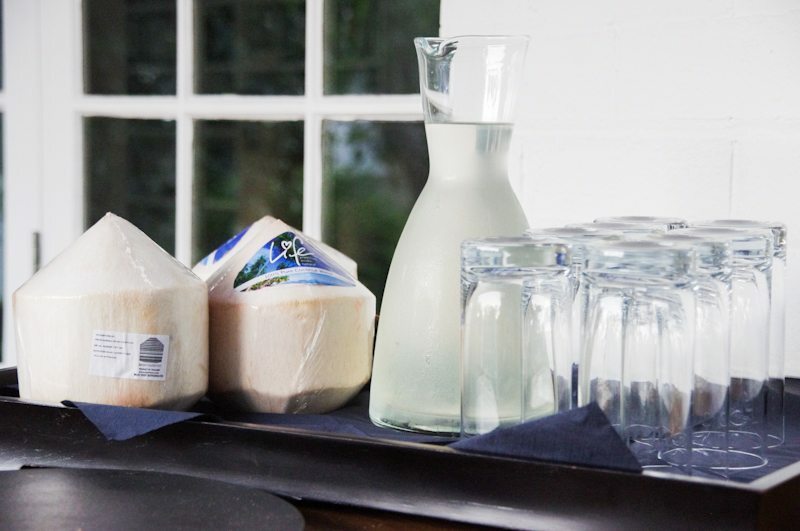 Place the buffet on wooden tables or large wooden chests. 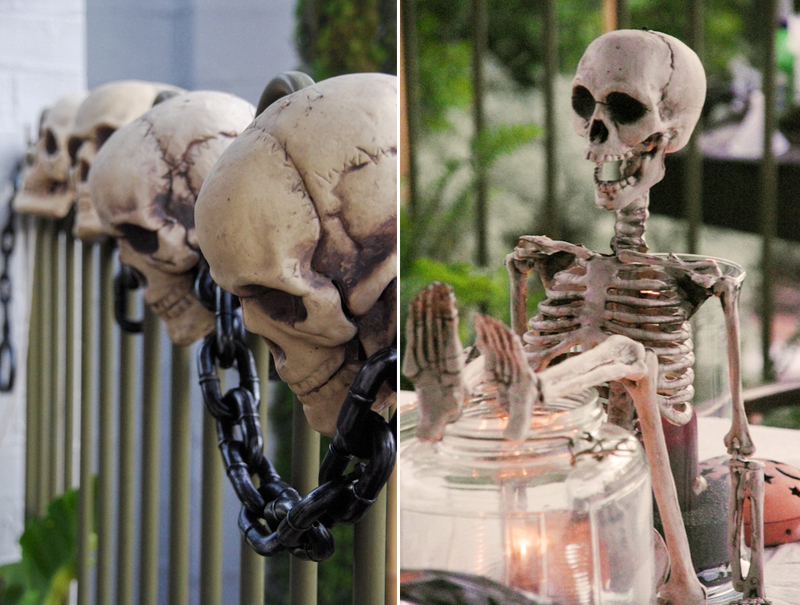 We had Crystal Head Vodka available but you can also buy skull head decanters to serve your own beverage mixes. 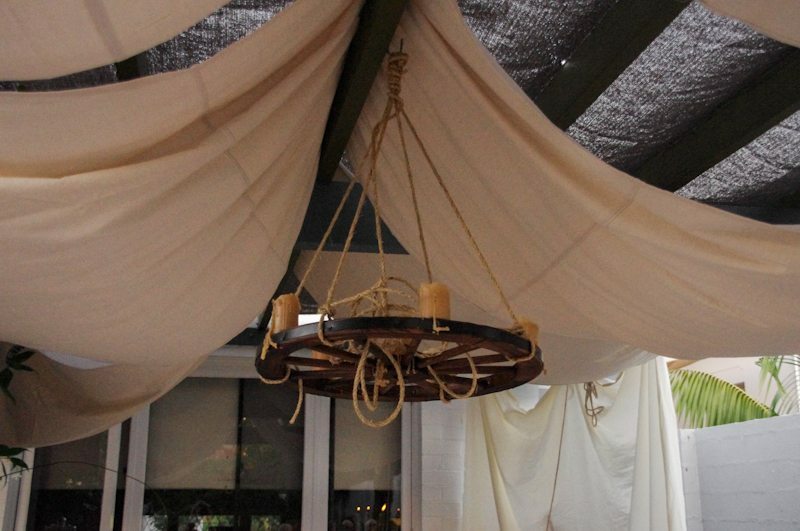 The lighting above the table was made by attaching and melting real candles to a large wagon wheel, and using rope to attach it to the beams. 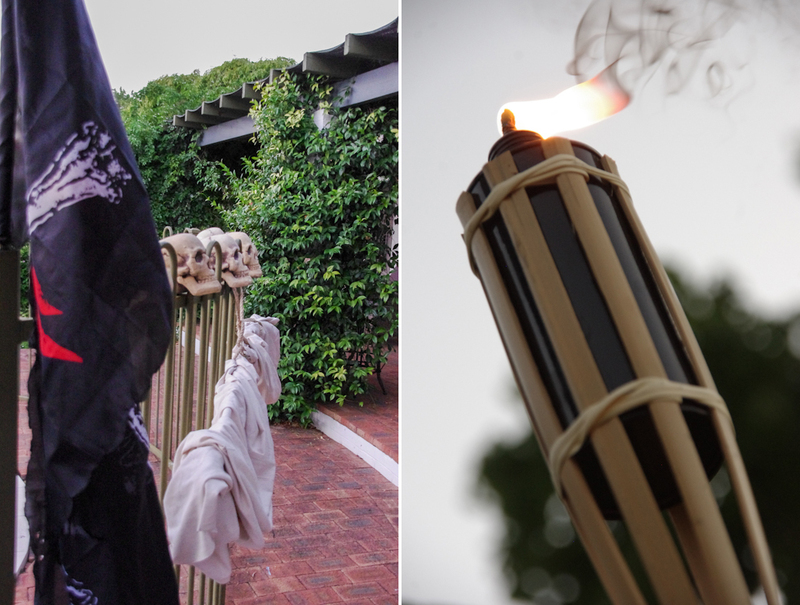 Note: on the night, we used small flameless candles inside the candles for safety. On the table we placed large glass jars with real candles in for authentic atmosphere. 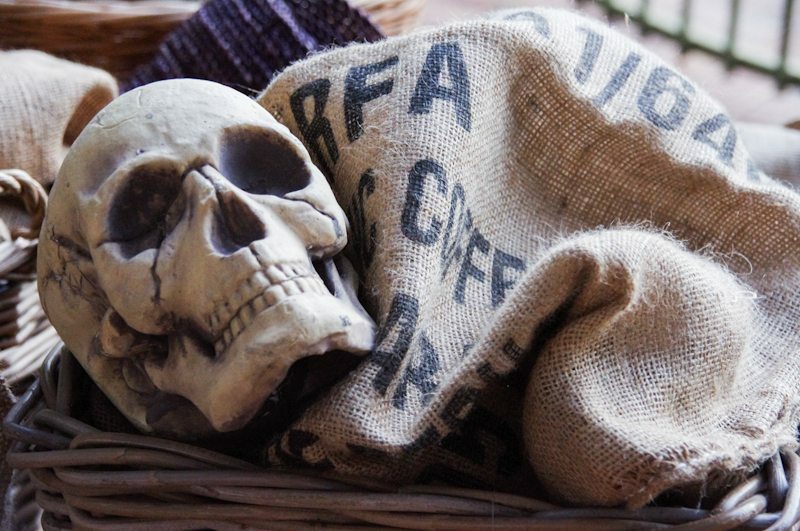 Whether you’re throwing a Treasure Island themed party, or just a generic pirate party, here are a few other decor essentials. 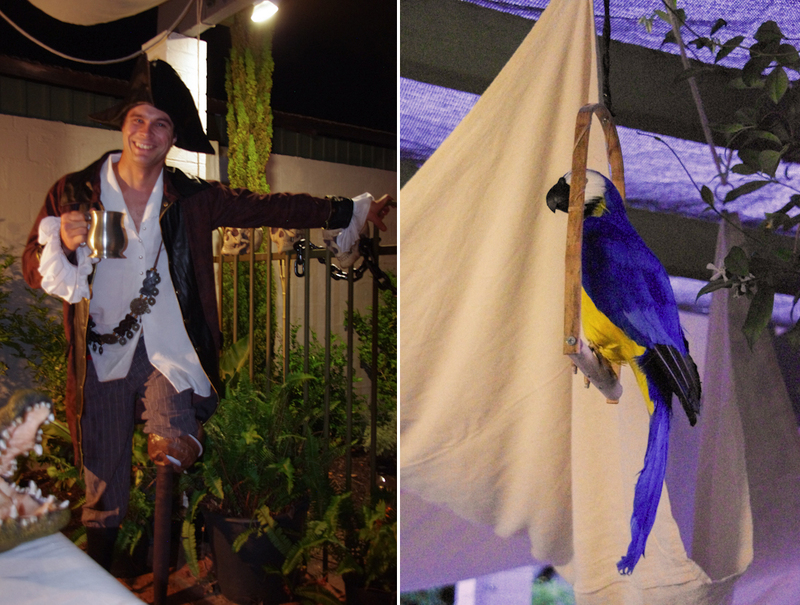 The food mentioned in Treasure Island wasn’t quite realistic for a dinner party, so I took inspiration from Trinidad and Jamaica- popular hang outs of pirates in history. 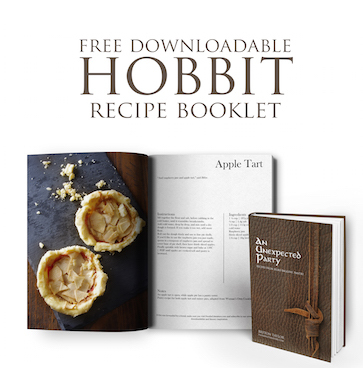 Realistically, you don’t need as many dishes as what I prepared for eight people, but I always prefer to overfeed people. Fruit platter with jackfruit, pineapple, cantaloupe (rockmelon). 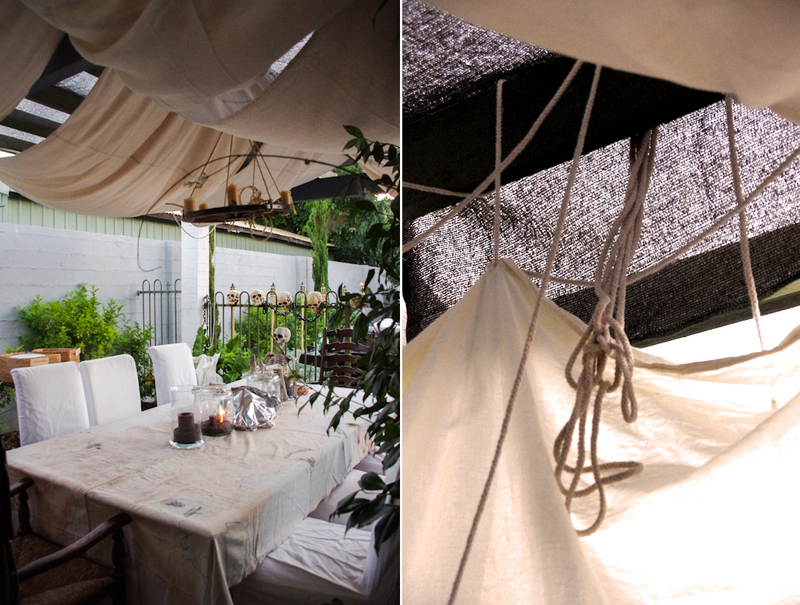 And with the props in place and our food ready, our dinner party began. 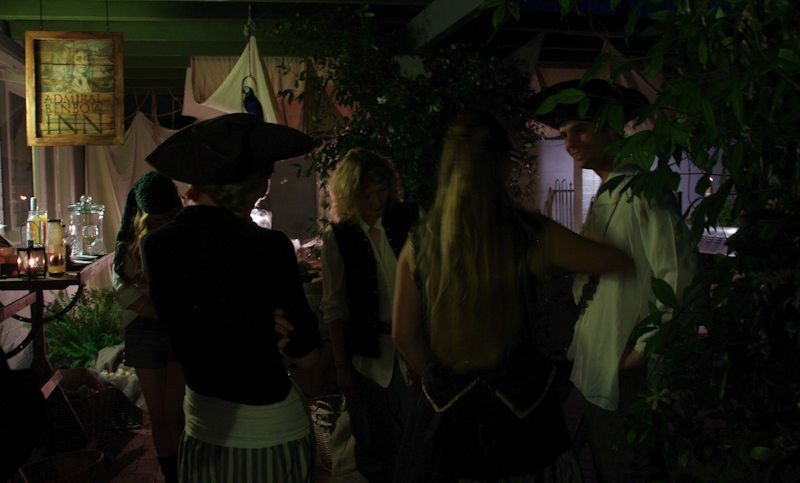 Just promise me you’ll invite me to your next pirate party, Bryt! 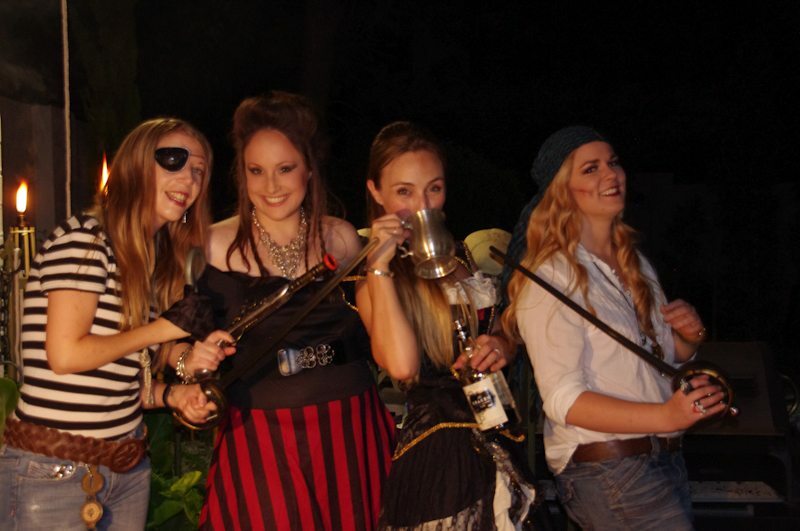 I’m a pirate afficionado from way back too! (And another big Harry Potter fan.) Great site you have here.